Summary of one of the video interviews regarding Putin’s strategy toward Ukraine. 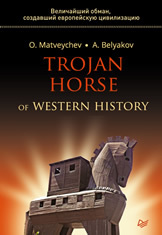 This book is about the fact that the Trojans defeated the Greeks and not the other way around, as it is commonly believed. This book is about the fact that the well-known Greek religion with its specific anthropomorphism was artificially created for some political reasons. This book is about the fact that soft power, information warfare and falsification of history do not constitute innovations, but are the oldest essential features of the Western mind. This book refutes the conventional wisdom that “history is written by the victors”. On the contrary, we have proven that the victors are the ones, who have managed to write history. other universals as “my other”, and we have shown the horizons in terms of solving the problem of postmodernism. This book tells the story of exciting journeys to both ancient Troy and to modern Troy. as bright, lively and entertaining as a mystery thriller. This book is about history unfolding like a musical piece, and by an audible note we can’t guess the previous note, and neither we can predict the next one or project the present into the past and the future. To hear the music of history one must have the historical ability to hear.